TAMPA, Fla. -- At Westchase Golf Club, you don't only have to hit it long, but you have to shape your tee shots if you want to score. Westchase Golf Club is one of the toughest courses in Tampa -- it's also one of the area's best bargains. At 6,699 yards from the tips, Westchase isn't particularly long, but it plays a lot longer if you can't control a draw or a fade. You'll need both of them to score here. Located only 20 minutes from Tampa International Airport, Westchase is one of the toughest golf courses in the Tampa Bay region; it's also in immaculate shape. Westchase Golf Club is a tough course and fair from each of the three tee boxes, but it also has its quirks. Fortunately, the carts are loaded with a ProLink GPS system that not only gives the yardage from any spot on the course but also has diagrams of each hole so you never have to worry about that hidden pond behind the green. "We are fair, but we challenge our golfers," Richard Veghte, Westchase's director of golf, said. "There's a lot of variety, but there are a lot of ways to play the course, from a recreational standpoint to a serious golfer." The Westchase experience begins at the aqua driving range. It's not ideal for anyone looking to get a good judgment of distance, but the tee boxes are well-maintained so you aren't hitting off dirt. There's a large putting green with plenty of undulation and a separate chipping green with a large bunker that's hidden behind the driving range and usually empty. The quirks start off right away on the first hole, a short, dogleg right par 4. 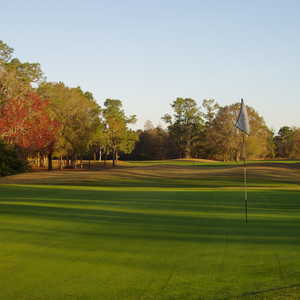 Trees line the left side, and the fairway curves around one of the many lakes at Westchase. From the white tees, a bomber can try to clear the lake and go for the green in one. It plays to 344 yards from the tips with a bunker in the back. The best play is to hit a mid-iron to the dogleg and hit it close with the approach, although it is tempting to pull out a second ball and try to crush it just for fun. No. 2 is another hole where a gambler can go for the par 5 in two, but there's water and woods everywhere. It's like that all around the back nine. Westchase is also a course where you had better be ready to use every club in the bag. Throughout the course, it's all about playing the draw on one hole and the fade on the other. Hitting it straight is fine, but anyone who can carve the tee shots can save a bunch of strokes. While you're packing the bag, make sure to remember the sand wedge. Every hole is heavily bunkered, surrounding tight greens. The back nine is a little easier but not a lot. The 12th hole is a monster par 4 with a narrow fairway with trees on the right and water all down the left. There are a few breaks with three of the easiest holes on the course on 13, 14 and 15, but the closing hole is a bear with a long tee shot leading to a long approach over marsh and no layup area. 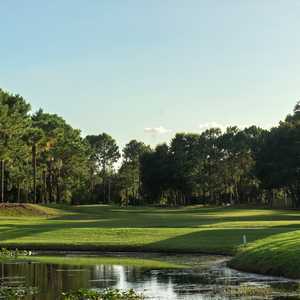 Westchase is one of the courses that make a travel excursion to Tampa worth your while. It's close to PGA Tour courses such as Inverness Golf & Country Club and TPC Tampa Bay, and it holds its own against both of them. Ray Dalton and his friend Mike Parsons were in town for the recent Outback Steakhouse Pro-Am, held at TPC Tampa Bay, and said they had heard about Westchase from a hotel concierge. "We wanted to see the Outback, but we knew we couldn't get on the course," Dalton said. 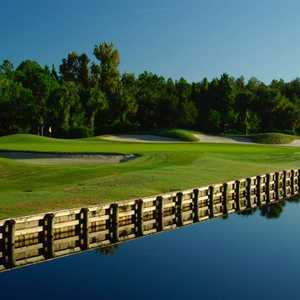 "We wanted to play a challenging course, and they told us about Westchase. We never heard of it before. They treat you so well around here, and it's tough but fair. It isn't target golf; it's just a lot of fun." When Parsons was asked if he was tempted to pull out a second ball to go for the first green -- the red tees are 286 yards -- he said he was tempted until he hit his regulation shot into the bunker at the corner of the dogleg. "I knew this was going to be a lot of fun when I hit the beach on my first shot. This is a great course. I would recommend it to anyone." Westchase Golf Club is simply one of Tampa Bay's best bargains. The course is in immaculate shape year-round and is challenging but fun. Be ready to use every club in the bag. You can score on this course, but being able to shape your shots is key.